I write adventure and environmental fantasy and speculative fiction for young adults and adults. The Cult of Dzur i'Oth wants its magical tome back. They can’t rule the world without it. The only person who knows how to destroy the twisted tome is Meena, a testy heroine who accidentally inherited immortality from the tome’s pages centuries ago. 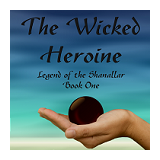 Long turned to cynicism by the petty whims of mortals, she’s secretive and brusque, dragging her young companions into mortal danger without a second thought. Yet the magical reach of the cult leader, the Hand of Power, is long. Even from the far side of the world, he causes chaos and death in order to retrieve the key to the tome’s magical prison. A glorified librarian, a substitute prince and a secret-wielding swordsman must resolve their interpersonal conflicts in order to aid Meena in her quest. But when the Shanallar makes an unexpected sacrifice halfway to their goal, can they carry on without her? Or is the world doomed to enslavement at the hands of a magic-wielding madman? ...it has everything – a legendary and immortal figure who influences the course of history, an expedition that forays into cultures foreign to the protagonists and highlights the differences between the peoples, a government conspiracy, a deep and secret evil that seems to be bubbling to the surface, sea monsters, sword fights, and a preternaturally gifted young girl who might be more than she seems. There is a definite coming-of-age theme here among these young people and also a bit of a love triangle, which did indeed pique my interest. What can I say? I'm a romance-a-holic. Add to the interesting characters, some fantastic settings and unique cultures--and here is a recipe for a true fantasy tale that takes you to places you could hardly imagine. The characters and settings are truly the books strengths, in my opinion.